For LAPD homicide cop Harry Bosch -- hero, maverick, nighthawk -- the body in the drainpipe at Mulholland Dam is more than another anonymous statistic. This one is personal. The dead man, Billy Meadows, was a fellow Vietnam "tunnel rat" who fought side by side with him in a nightmare underground war that brought them to the depths of hell. 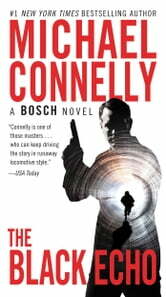 Now, Bosch is about to relive the horror of Nam. From a dangerous maze of blind alleys to a daring criminal heist beneath the city to the tortuous link that must be uncovered, his survival instincts will once again be tested to their limit. Second time I've read this book. I've known men who went to Vietnam at 18 & Harry Bosch is them. The pain, insomnia, feelings of not belonging. You won't want to put this book down once you start reading it. One painful twist after another. Intelligent and thoughtful. Start with this first book in the series & then read the rest. You won't be disappointed. Incredibly good, fast read. Love the main character and all the fine details that pull you deep into the story. Great read. Connelly writes a good mystery. Great story and plotline, as is a usual trait of all his novels. Intelligent, page-turner. I recommend! Scary! Imagine being in a Vietnam spider hole. My greatest respect for anyone who tolerated those conditions for their own country . When a story is placed in a certain time period, it is realistic to use devices and situations of the times. Perhaps some people who have reviewed this book don't have an understanding of realism? I had a hard time in sleeping with this book. I was emotionally involved, because I am empathic .